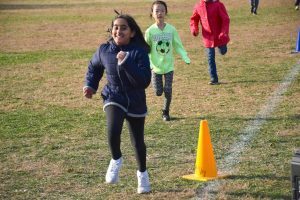 Turkey trots at East Meadow School District’s Meadowbrook and McVey elementary schools helped to promote family fitness while boosting excitement for the Thanksgiving holiday. 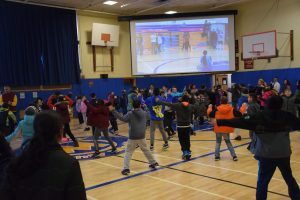 Due to inclement weather on Nov. 20, the Meadowbrook Elementary School physical education department moved its second annual turkey trot indoors to the building’s gymnasium. Students accumulated a great number of laps around the basketball court to the sound of holiday music. The event demonstrated the community pride and generosity of students and parents as nonperishable food items were collected and donated to Island Harvest for the holiday season. McVey Elementary School was fortunate to have the cooperation of the weather on Nov. 21, when students were able to welcome special guests to join them for laps on the school’s back lawn. The physical education department set up a quarter-mile lap that participants enthusiastically walked or ran around. Each grade participated at designated times during the day with the goal of completing at least two individual laps. The district congratulates and thanks the students and special guests for their involvement in the turkey trots and for giving back to the community. Students at McVey Elementary School stretched and warmed up prior to running laps as part of the school’s turkey trot on Nov. 21. 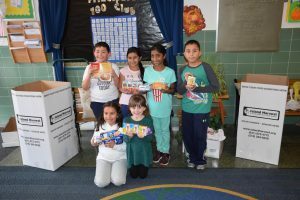 Students at Meadowbrook Elementary School showcased the collected non-perishable food items that were donated to Island Harvest for the holidays. McVey Elementary School set up a quarter-mile circle that students ran laps around during a turkey trot on Nov. 21. 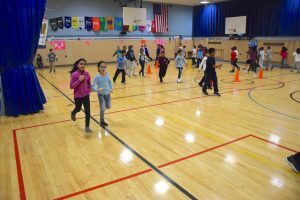 Despite being moved inside due to inclement weather, students at Meadowbrook Elementary School still managed to get their turkey trot laps in on Nov. 20 in the building’s gymnasium.